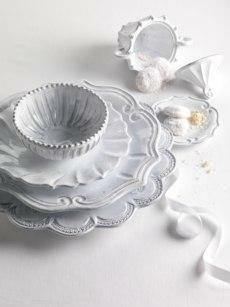 VIETRI exclusively imports the most beautiful handcrafted Italian products for tables, homes and gardens in the world. Master artisans, inspired by Italian art and fashion, produce timeless designs that inspire casual yet elegant living. A favorite of brides and the press, VIETRI continues to set trends in the tabletop industry with 26 years of ...... Read More VIETRI exclusively imports the most beautiful handcrafted Italian products for tables, homes and gardens in the world. Master artisans, inspired by Italian art and fashion, produce timeless designs that inspire casual yet elegant living. A favorite of brides and the press, VIETRI continues to set trends in the tabletop industry with 26 years of Irresistibly Italian success. We hope you will share with your customers the handcrafted qualities that give VIETRI products their charm and individuality. Slight variations in size and color, paint smudges, fingerprints, looseness of lids and antiquing irregularities are all characteristics of truly handcrafted one-of-a-kind products. However, if the eating or front surface of a product is chipped or unglazed, please call us to request a replacement. VIETRI stands behind all of our products for quality and safety. Independent laboratories regularly test VIETRI's dinnerware lines to assure FDA standards for lead and cadmium. VIETRI is also in compliance with California's Proposition 65. Any item in our line that is not recommended for food use will have an indication as such on the piece.